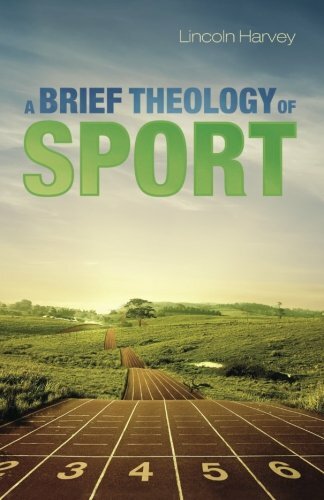 My last post looked at two ideas I found important and helpful in Lincoln Harvey’s book A Brief Theology of Sport. Overall, I enjoyed the book finding it accessible and timely. Today, however, I want to consider a question I have about the book and I think it is a question Harvey expects because he seems to spend time offering an answer. At the beginning let me state, I am unsure if have I understood Harvey because at times I want to agree with his explanation and at other times I want to disagree (it could be that I’m confused!). Thus, I present this as a question seeking further explanation. “(Sport) is an event in which the creature, as itself, celebrates itself” (94). “Worship is the liturgical celebration of who God is with us. Sport is the liturgical celebration of who we are by ourselves” (94). “In worship, God in his freedom is committed to being present to his people in this reality…In sport, however, the opposite is the case. God instead steps back, evacuating the space created by the liturgical action…He is in one. He is out of the other” (95). “Sport is only for sport. It is the one thing that is not directed to the glory of God. That is what sets it apart” (96). If I understand correctly, these statements arise from the premise that to make sport about something other than sport ruins it. Since sport is “autotelic,” meaning it has no meaning outside itself, to make sport about something changes it from sport to something else. Thus, sport cannot be a celebration of anything outside itself because to make sport about celebrating God, or for the glory of God, is to make it about something else. Sport, therefore, must be the celebration of who we are apart from God, a space where we can exist in nothing but our nothingness (our not ‘Godness’). “(Sport) is graced creatures living out grace. We chime with our own being” (94). “(In sport) God instead enjoys watching us being ourselves as we pivot freely between himself and nothingness” (95). “That is precisely what is so amazing about sport. It is not for God. It is simply the graceful creature” (96). Sport is surely different from worship, as Harvey explains, because in worship we approach God in all his glory. On the other hand, sport is where we approach God in all our glory. Glory that because it is given by him pleases him. Thus, sport is a celebration of who we are in ourselves but not of who we are by ourselves. It is a celebration of ourselves as graced by God. ** Furthermore, sport can be celebrated by God as we live out the unnecessary-but-meaningful existence he graced us with in the first place. *Harvey seems to make a similar point, “When we play – unnecessary but meaningful – we are living out our deepest identity as unnecessary but meaningful creatures” (84). **Harvey seems to make a similar point (although on this point I’m not sure we are meaning the same thing), “When we play sport, we are celebrating our freely determined form as these particular creatures through a freely determined rule-governed unnecessary-but-meaningful activity” (93).